Their process is simple. Donations given by people fund the meal ingredients. Volunteers hand-pack the meals. Meals are donated to FMSC food partners around the world, where kids are fed and lives are saved! Christi Clarke, Karen Carver and Tobey Scollmeyer were selected for the MannaPack Labeling shift. 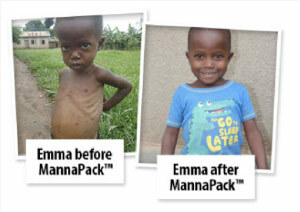 The MannaPacks are the plastic pouches of food shipped to the countries with children in need. They contain rice, soy, vitamins and dried vegetables. When the needy children get these on the other end they boil them in the cleanest water they can find also an issue, to feed their bellies. The team learned that the children are fed a clay mixture when they have no real food like the MannaPacks just to fill the void of hunger temporarily. This is the same clay they make coffee mugs out of – very sad. 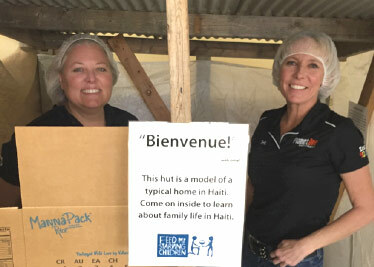 The team reported that the experience was very rewarding – they talked a lot about how we take for granted the food on our table, and spoke with some of the staff and discussed how they even get to visit these recipient countries and see how the donated food positively impacts these kids. They also met some of the volunteers that go weekly or even several times a week to help including families with young children volunteering which was heartwarming to see. The atmosphere in the MannaPack packing area was very fun with oldies music playing loud and a focus on working fast to get as many boxes packed to fill the truck. 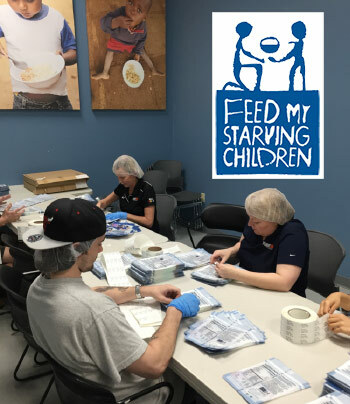 Other shifts were completing tasks of labeling and packing food and the team decided that next time they would like to be part of the food packing or warehouse crew – it seemed like they were like a Baseball team and every full box they completed they yelled out as if it was triple home run which was exciting to hear! All in all the mighty PlanetOne volunteer team packed a total of 98 boxes – which will feed over 26,000 children. Christi, Karen and Tobey, thank you for your incredible representation of the PlanetOne spirit – we appreciate your giving From the Heart.